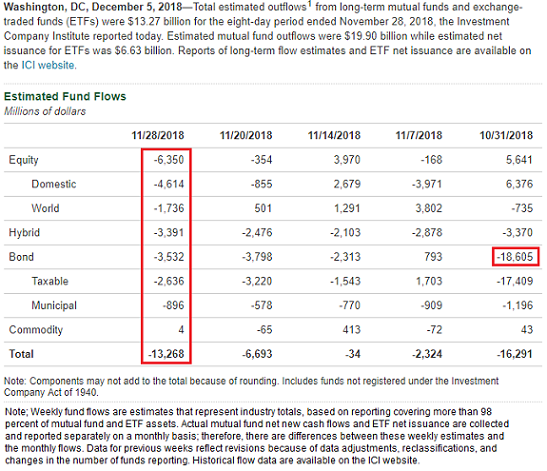 The most recent flow data for ETF’s and mutual funds reported by ICI last week notes outflows occurred in nearly all of the broad asset categories. One exception was a small positive flow into commodity oriented investments. Following the large $18.6 billion bond investment outflow for the week ending 10/31/2018, bond investments continued to be sold by investors. Below investment grade bonds bore the brunt of this late October outflow. The below chart displays the 1-month rolling sum of ETF and mutual fund flows. 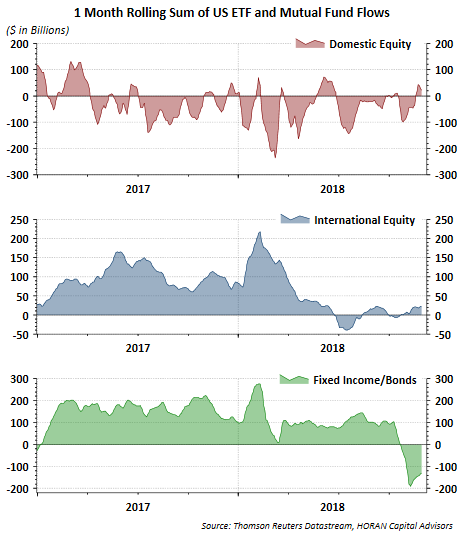 For most of the two years shown, domestic equity funds experienced outflows. Until mid year this year, international equity funds were beneficiaries of inflows. The green chart in the bottom pane shows the recent bond outflows. For the most recent week Refinitiv/Lipper Alpha Insights noted fund investors favored money market funds to the tune of +$5.0 billion for the week ending 11/28/2018. 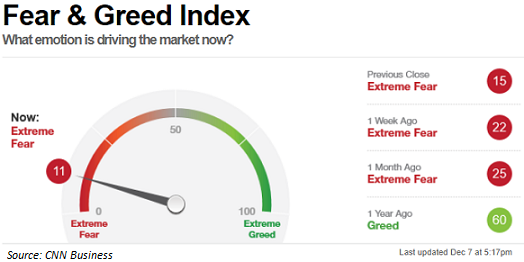 This risk off investor activity is occurring at the same time the CNN Business’ Fear & Greed Index is at an extreme fear level. The latest reading of 11 is approaching the level recorded earlier this year during the late January into February market decline. The equity market’s price action and technical picture is certainly not rewarding investors who are long the market as the month of December approaches its midpoint. The earnings picture and economic backdrop are suggesting a more favorable environment as one looks to 2019 though. A couple of good article links reviewing the current market and economic data are listed below. A Look At Q4 ’18 and 2019 EPS & Revenue Estimates for the SP 500?